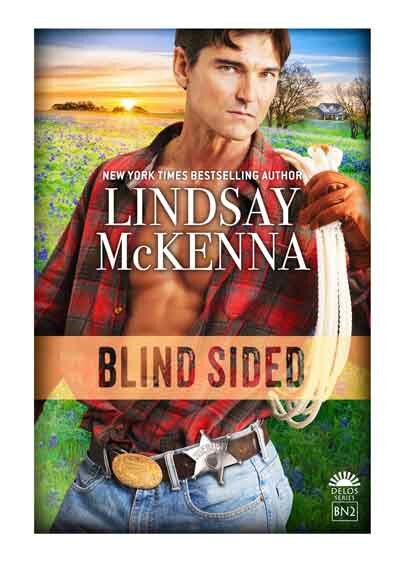 PRE-ORDER AVAILABLE ON UNBOUND PURSUIT by Lindsay McKenna!! We’re right on the cusp of the 4th of July holiday in the USA. It is our Independence day. We need to thank all the people who gave their lives, give them our grateful thanks and prayers, for giving everything so that we could have the freedom we enjoy today. And toward that end, our military around the world right now, as well as the vets who have also sacrificed so much for us, should be thanked and appreciated as well. Freedom is not free. UNBOUND PURSUIT is the sequel to TANGLED PURSUIT, Book 2, of the Delos Series. If you have read it? Then you know Tal Culver, Captain, USMC, and the war she fought on an emotional front with US Navy SEAL, Chief Wyatt Lockwood. He’s a good ole boy from Texas, raised on a ranch in West Texas, and doesn’t take “no” for an answer. If you haven’t read TANGLED PURSUIT, do so, because it will make UNBOUND PURSUIT all the more richer for you to appreciate and enjoy! But it can be read as a stand alone novella. 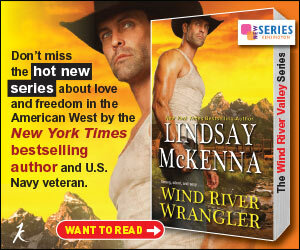 Captain Talia Culver risked her heart again for Navy SEAL Wyatt Lockwood. The brave, cocky Texan was worth the risk and Tal couldn’t be happier. Still recovering from her injuries she received from her last mission in Afghanistan, Wyatt whisks her away to meet his family on their sprawling Texas ranch. But things don’t go as planned when Wyatt hears local gossip that his drug dealing ex-friend is out of prison and planning a drug run across the Lockwood ranch. Wyatt wants to enjoy some hard-earned down time with Tal, but he can’t ignore the danger at his back door. Tal Culver had turned around to watch Mattie Lockwood, who with swift, knowing precision had gone to work dumping the paint-filled water from the thirty jars, washing them, and turning them upside down to dry on tea towels she’d set on the countertop. The back door opened and closed, getting Tal’s attention. The children could come and go through two different exits. The side door led to the playground. The rear door, near the sink where Mattie worked, was hidden from view by a large mudroom. The hair on the back of her neck rose, instantly making Tal focus her attention on the entrance. Normally that reaction served to warn her that there was danger nearby, and it wasn’t something Tal ignored. She was in Texas. In a kindergarten classroom. Why was she suddenly on high alert? A dark shape appeared at the entrance. Mattie turned. She gasped. The Mason jar in her hand slipped and fell to the floor, shattering. She hadn’t heard his voice in four months, that same low, sensual drawl of his that made her melt, made her lower body burn with need of him. Gulping, she jerked a look toward Tal. “That’s Tal Culver, my friend,” she managed to say, choked up. She turned toward him. “What are you doing here?” Tears clogged her eyes but Mattie refused to let them fall, straightening her spine, throwing back her shoulders, her chin jutting out, anger flowing through her along with her shock. Her voice was shaking, she was so angry and hurt. And he looked so delicious to her. He was half Chippewa Indian through his mother, who was now dead. He had his mother’s coppery skin, that shining short black hair, those glittering, intelligent wolf eyes, as she used to refer to them, a gold-brown mixture. His mouth thinned, relaxed a little. For a split second, Mattie thought he’d smiled, or that maybe some amusement had flittered across his narrowed, intelligent gaze. His gut clenched, his heart twisting with guilt and need of her. Mark tried to bury the pain he carried deep within him. He watched the flare of righteous anger in Mattie’s slitted dark green eyes. Reining in the desire for her that was always with him, he rasped, “Okay, then here it is: you tell your father to keep his wranglers out of the northeast corner of your ranch two nights from now, Mattie.” His voice dropped. Before Mattie could snarl at him, he turned on his heel and was gone. When the door slammed shut, Mattie jumped. She was breathing raggedly, her heart sledgehammering in her chest. Gulping, she looked at Tal. “Are you okay?” Mattie asked in a trembling tone. Tal reached out, feeling her shaking. Mattie’s face was white, her freckles standing out against her tightened skin. “How are you doing? Do you want to come and sit down? Can I get you a drink of water?” Tal could feel the tension in her, saw the tears glimmering in her eyes. Mattie was valiantly trying not to cry. “Come on,” Tal urged her gently, “come and sit down for a minute.” Mattie looked so shaken Tal wasn’t sure she wasn’t going to faint on her. And if she did, Tal wouldn’t be able to break her fall, thanks to her weakened ankle. Jerkily, Mattie nodded, covering her eyes for a moment, trying to hold herself together. She tried to shove down her dark past, her love for Mark. After all he’d done to her! If the townspeople ever knew what had happened, she’d never live it down. Never had she ever wanted anyone but Mark. It was a destiny and a curse. She still loved him. Mattie denied it, but inside, in her private moments, her heart ached for Mark. Around her, from childhood onward, Mark had been vulnerable, despite his hard life. Mattie had seen the scars where his flesh had been peeled back when his angry, alcoholic father would unmercifully beat him with his belt. She knew he’d gotten those scars when he’d stepped between his father and his sister, Sage. Matt had made himself a target to protect Sage from being sexually molested. His body had been deeply scarred over time. To this day, Sage’s loyalty to her brother was solid, and Mattie knew why. Mark had protected her from her father. And Sage loved her brother as fiercely as Mattie did, but for different reasons. Sitting down, Mattie was grateful for Tal’s quiet strength, her hand resting on her slumped shoulder as she tried to control her inner tumult. “I don’t know why he suddenly showed up,” she whispered, her voice quavering. Tears spilled down her cheeks, and she turned her head, ashamed that Tal would see her cry. “N-no,” she whispered, quickly wiping the tears away, humiliated that her future sister-in-law-to-be was seeing her like this, a muddled mass of jellied emotions, pulverized by Mark’s shocking appearance. Frowning, Tal smoothed her hand gently across Mattie’s shaking shoulders. She was crying. Tal put herself in Mattie’s place. This would be a helluva shock for anyone to take. Almost like a dead person returning from the grave. “Sometimes, when you love someone, it takes a long time to get over it,” Tal told her. “Only you can answer that,” Tal said gently, smoothing back some strands of red hair that were sticking to her damp cheek. Never mind she still dreamed like the child she was of what might have been if they’d married once they were out of high school. The year they spent together when they were teenagers, after their relationship moved from friendship to something more, had been heaven on earth. Mark been so gentle and open with her, so incredibly loving. Sometimes, Mattie felt as if Mark had a lifetime of love stored up for her from the time he was born. At six years old, seeing him in the first grade, she’d fallen in love with him. It was the most beautiful feeling in the world to have him unveil the deepest, most beautiful parts of himself, his dreams, his wishes, with her. People called it puppy love, but the feeling had never gone away. And when she was sixteen and he finally opened up to her, let himself be as vulnerable as she was, and tenderly loved her, her soul had wept with joy and pleasure. He had been that loving. But then their lives had spiraled into a darkness she could never have imagined. And it had torn them apart even though they still ached to be with one another. After that, Mark had changed abruptly. Forever. He was no longer open with her; he shut down. She knew why. It was a secret both of them would carry to their graves. The more Mattie tried to remain close to Mark, the more he retreated from her, those hard shields that he had always kept between himself and most other people began rising against her, too, cutting her off from his soft side. Mattie was too ashamed, too guilty and young, to figure out how to salvage the love they held for one another. And to this day, she beat herself up, knowing that one night had changed their lives and made Mark suddenly disconnect from her forever. Want to listen to TANGLED PURSUIT? Here’s the info of when it will be available! Coming in 2016, audio version of UNTANGLED PURSUIT! BLOG TOUR with RUNNING FIRE by Lindsay McKenna! What’s in a NAME? What is in a name? Read my post about how I go about figuring out a name of the hero and heroine today on my Harlequin Blog tour for RUNNING FIRE! Names are special to me as a writer. 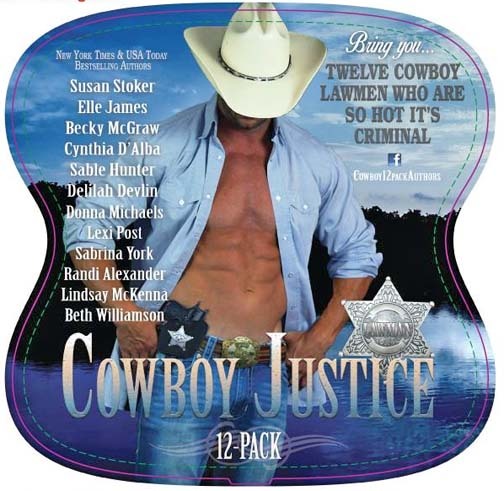 Check out today’s post on my Harlequin Blog Tour for RUNNING FIRE and find out how and why I chose the names I did for the main characters of my book! Readers, are character names important to you? Have you ever read a book with characters whose names don’t “fit” in your mind? Do you have difficulty connecting with a character when you don’t know how to pronounce his/her name? 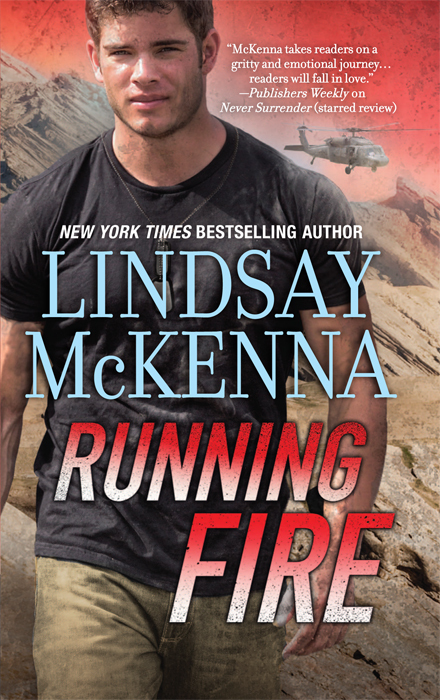 Lindsay McKenna BLOG TOUR STOPS for RUNNING FIRE — join me!! 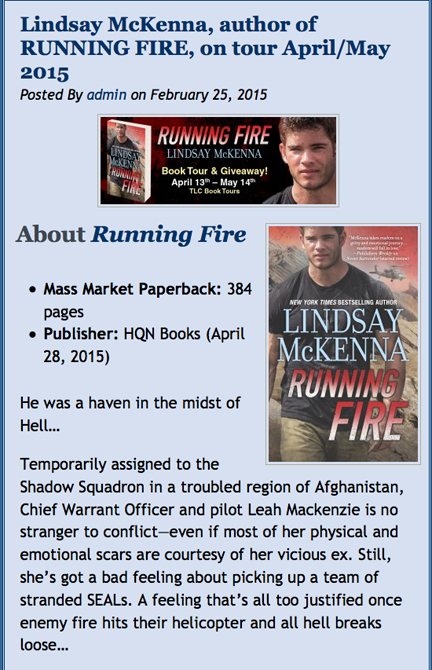 I hope you’ll join me on my Blog Tour with TLC, for RUNNING FIRE, HQN, 4.28.2015! I love blog tours because it gives me a chance to interact with my readers. And it also gets my name and books “out there” in the vast land of the Internet. 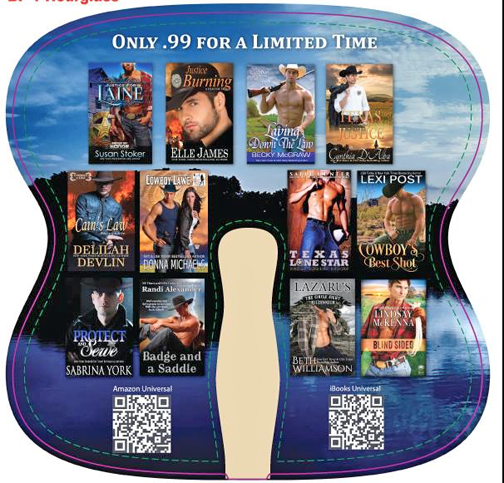 Please go to TLC’s URL for my blog tour schedule. The reason you want too is that I create posts at some of the stops. These posts are important because it gives me a chance to elaborate on the book, a specific character or a behind-the-scenes info that you wouldn’t get anywhere else. To get the URL’s for each stop, just visit TLC’s website below. TLC Blog Tours is sponsoring RUNNING FIRE. Their entire list of participating blogs/websites is right here! Join me on my tour by date and URL website! Tuesday, April 28th: My Life. One Story At a Time. 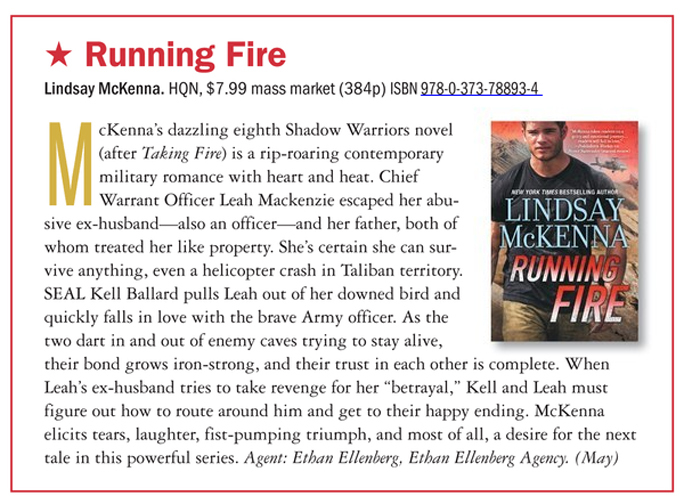 RUNNING FIRE received the vaunted and rare red star (starred) review from Publisher’s Weekly Magazine. That’s akin to an actor winning an Oscar. exclusive content, my coming books, a give-away and so much more! And to view earlier newsletters, just go here! Stick around for the next 30 days as we do a blog tour on my last Shadow Warriors Series book, RUNNING FIRE! Publisher’s Weekly Magazine, the icon of the publishing industry, gave my book at “starred” review, which is akin to an actor or actress winning an Oscar. It IS a big deal to be singled out by PW and given the vaunted but rare red star review. And here it is! I wrote a post for http://www.bookmama2.blogspot.ca on WHY I wrote RUNNING FIRE. I think you’ll find it provocative. SHARE if you agree. Do let me know! 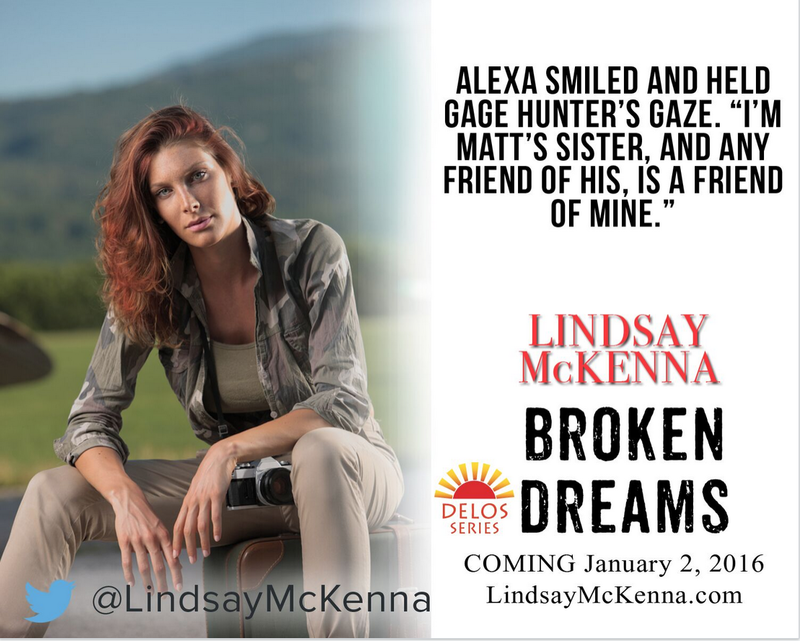 Please run over to my website, http://www.lindsaymckenna.com and sign up for my NEWSLETTER! It comes out quarterly and is chock full of information on my books that are coming out, plus a reader give-away, and exclusive info on some of my past books! 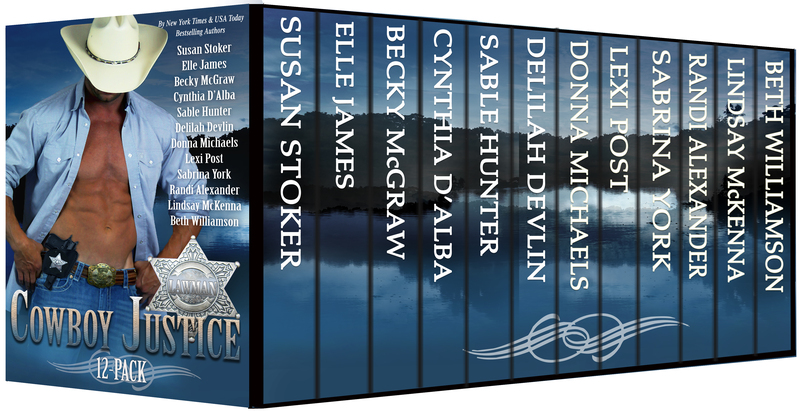 You are currently browsing the archives for the blog tour category.